For potential students of every type, learning if a college or university has the academic program(s) that interest them is a top task, usually the first or second most important on their first visit. Making that task as easy as possible to complete is a marketing strength. “We are going through a redesign and the agency is trying to arrive at a solution to the alphabetical program list, with the idea of using a program finder. The pushback is that at a small liberal arts school, we don’t want to steer people away from any potential program so the idea of a program finder is not popular among faculty. Likewise, they are not keen on the idea of breaking programs into smaller lists for humanities, social sciences, physical sciences, etc. Most potential students who come to a page like this already have an academic program in mind. Their task is to find out if Gettysburg offers that program. Why make that more difficult than it needs to be by substituting (or adding in priority place) a “program finder”? A key point: If you don’t know that an alpha list is not working for potential students, don’t go in search of a solution to a problem you likely don’t have. On Mobile… a very rapid 3 second download speed. Google Test My Site gives the Gettysburg page an unusually strong 3 second mobile speed rating and a “low” estimated visitor loss from the download time. 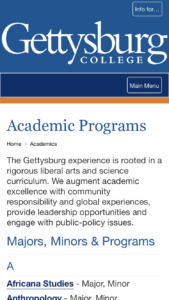 Visit an admirably strong academic program page at Gettysburg College. Join 594 people on the Top Tasks: Higher Education Website Content group on LinkedIn.